FILE - Robert F. Kennedy Department of Justice Building. After more than a week of finger-pointing between Republicans and Democrats over the propriety of the so-called Nunes memo, law enforcement veterans are increasingly concerned that the dispute is undermining public confidence in the Justice Department as an independent, non-partisan law enforcement body. President Donald Trump has seized on allegations of surveillance abuses at the Justice Department and the FBI to accuse their top brass of politicizing "the sacred investigative process in favor of the Democrats and against Republicans — something which would have been unthinkable a short time ago." While past presidents have been accused of using the Justice Department for political ends, never before has a president gone as far as Trump in publicly eviscerating the nation's top law enforcement agencies and the officials he hand-picked to lead them. If Trump has lost confidence in his law enforcement leaders, said former attorney general Alberto Gonzales, he should replace them "with people that he believes can do the job." 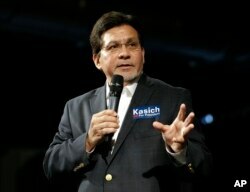 FILE - Former U.S. Attorney General Alberto Gonzales speaks at a rally in Nashville, Tennessee, Feb. 27, 2016. "The public shaming of these individuals, in my judgment, does great damage to the morale of everyone who works at the Department of Justice," Gonzales said. "I worry that the public's confidence in the integrity of investigations and prosecutions by the Department of Justice is being eroded," he said. "I think that's a terrible place to be." There is evidence that public confidence in law enforcement is taking a hit. A SurveyMonkey poll, conducted last week for the Axios news site, showed overall favorable attitudes toward the FBI had declined over the past year. The FBI and the Justice Department are uniquely American institutions. In its crime-fighting mission, the FBI is the closest thing the U.S. has to a national police. But in recent decades, the bureau has evolved into a full-fledged domestic intelligence and security service, increasingly focused on fighting terrorism. The Justice Department oversees the FBI. The department head, the attorney general, is both a member of the president's cabinet and the nation's chief law enforcement officer, a dual role played by ministers of justice in countries such as Canada. This tradition of independence dates back to Watergate, the 1970s political scandal that led to the resignation of then-President Richard Nixon and spawned a series of reforms designed to insulate law enforcement activities from political meddling. 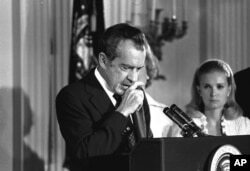 FILE - Richard Nixon performs the last acts of his presidency in the White House East Room, August 9, 1974, as he bids farewell to his Cabinet, aides, and staff. Nixon's attempt to use the FBI and the CIA to hamper the Watergate investigation and his summary firings of key law enforcement officials during what became known as the Saturday Night Massacre led Congress to enact measures to limit presidential power and prevent similar abuses in the future. To shield the FBI from political interference, a 10-year term was set for its director to overlap multiple presidencies. To investigate government misconduct, a provision was made for the appointment of an outside prosecutor. And to oversee government intelligence gathering, Congress created the Foreign Intelligence Surveillance Court. Not all the reforms were implemented. Nor were they enough to fully insulate the Justice Department from charges of politicization. But a tradition formed that the Justice Department and the FBI should carry out their law enforcement activities independently of the White House. "The post-Watergate era has made the Department of Justice wary of political interference," said Victoria Nourse, who served as a Justice Department prosecutor and White House lawyer during the administration of former President George H.W. Bush. The post-Watergate environment also made it politically difficult for the president to remove his attorney general and FBI director, even though he has the power to do so, said Nourse, a law professor at Georgetown University. "The only restraint here is political, which is to say, if he were to do those things, the other side would say, 'Look, this is improper action, and it has to result in censure or some kind of impeachment,'" she said. Conservative allies of Trump question the Justice Department's and FBI's "independence." "[The Justice Department] and FBI aren't independent, nor should they be," Sean Davis, co-founder of the Federalist, tweeted last week. "Few things are more damaging to a democratic republic than men with guns and badges and wiretaps believing they are accountable to no one." Yet presidents, Democratic and Republican alike, have embraced the tradition since Watergate, former attorney general Gonzales said. When Special Counsel Patrick Fitzgerald was investigating the public identification of CIA operative Valerie Plame, which began in 2003, "I made it quite clear to the president and everyone in the White House that we were going to stay away from the investigation," Gonzales said. "We [were] not going to challenge the investigation or criticize the investigation." FILE - Former CIA officer Valerie Plame Wilson speaks at an event in Chicago, May 9, 2008. Trump has all but upended that tradition. Faced with a sweeping investigation into whether his campaign worked with Russian officials to win the 2016 election, Trump has repeatedly claimed the agency's probe is a politically motivated "witch hunt." Weeks into office, he pressed to stop Attorney General Jeff Sessions from recusing himself from overseeing the probe, and publicly humiliated him by suggesting he'd never have picked him had he known about his decision. Last May, Trump fired FBI Director James Comey, who was heading the investigation, after asking Comey to "let go" of an inquiry into former national security adviser Michael Flynn's interactions with Russian officials. After he tapped Christopher Wray to replace Comey, Trump reportedly urged the firing of the FBI's No. 2 official because of his alleged Democratic allegiances. 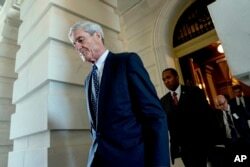 And, ominously to critics, Trump has launched a full-on assault on Special Counsel Robert Mueller's investigation, calling his lawyers biased and kindling fears that he may fire Mueller. None of this has happened under any president since Nixon. Meanwhile, Trump's Republican allies in Congress joined in the fight, which is what led to the Nunes memo. The irony, said Joyce Vance, an Obama-appointed top federal prosecutor, is that the criticism of the Justice Department comes from a Republican administration. "The department is often criticized for being a conservative organization," Vance said. "What people I think don't always know is that prosecutors and agents, alike, leave their politics at the door." Trump's own appointed leaders of the FBI and the Justice Department have shown few signs of bowing to pressure. To Trump's fury, Sessions recused himself from the Russia investigation. Deputy Attorney General Rod Rosenstein drew Trump's ire by appointing Mueller to lead the Russia investigation. And Wray reportedly refused to fire his deputy, despite Trump's demands. In the aftermath of the memo's release, Sessions and Wray have put out subdued statements of support for the rank-and-file at the Justice Department and the FBI. Asked how Sessions has handled his job in the face of Trump's repeated interference, Gonzales said, "All I'd say is, his job is to defend the department. I know he's recused himself from the Russia investigation, I get that. But nothing prevents him from supporting the men and women of the Department of Justice, including the men and women of the FBI." Will US Intelligence Agencies Stop Confiding to Congress?